Added on July 18, 2018 by Matt Byers. Come and celebrate the grand opening of Chirigos Designs in Deephaven along with the artists from Kolman & Pryor gallery tomorrow evening, July 19th. Read more about it here. Added on March 1, 2018 by Matt Byers. Star Tribune arts writer Alicia Eler named "Remnants" and concurrent exhibition "For the Gods" one of the fie must see shows on February 17th. The work was also featured in an article in the Mankato Free Press. See link by clicking here. Added on January 27, 2018 by Matt Byers. Come and enjoy lunch and an artist talk about my current exhibition "Remnants" at the arboretum at Gustavus Adolphus College. Tickets are $9 and can be purchased here. Added on April 10, 2016 by Matt Byers. My exhibition, "Submerge," at the Hillstrom Museum was chosen as this week's Art Spotlight in the Minneapolis Star Tribune by Mary Abbe. Read the article here. Robb Murray recently reviewed the same exhibition in the Mankato Free Press. Added on December 9, 2014 by Matt Byers. Please come and support Midway Contemporary Art this upcoming Saturday, December 13th from 6-10 PM. I will be drawing from 7-8 PM. Added on March 2, 2014 by Matt Byers. I am the featured artist today on 365 artists, 365 days. The blog is a collaborative project between the Frank Juarez Gallery and Greymatter Gallery. Check it out by clicking this link: 365 artists, 365 days. Added on January 12, 2014 by Matt Byers. Added on November 17, 2013 by Matt Byers. Please join me for the premier of Painting the Place Between at the Fitzgerald Theater on Friday, December 6th. I hope to see you there! Tickets can be purchased for a discount at Wet Paint art in St. Paul, through Ticketmaster or at the Fitzgerald box office. Added on August 13, 2013 by Matt Byers. Four Minnesota painters come together for a large-format painting exhibition with similarities and differences in the ways they approach abstract painting. 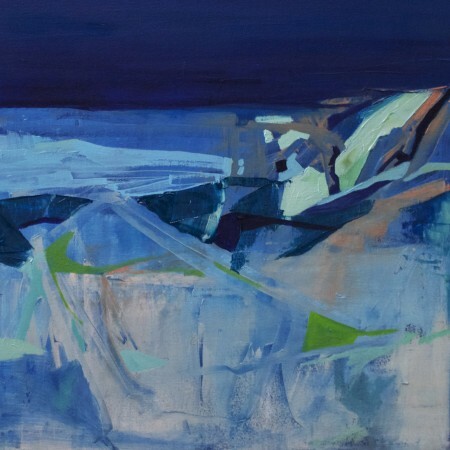 What their painting holds in common is their obvious love for the physicality of paint, their desire to create worlds that the viewer can enter, and their commitment to work forward in the historical tradition of abstraction, drawing on the past with the intention of developing a new visual vocabulary. Abstract art uses a visual language of form, color and line to create a composition which may exist with a degree of independence from visual references in the world. The techniques and sources from which each of these artists draws upon are diverse. "Beckon II" was acquired by the Hillstrom Museum of ARt and will be featured in an exhibition from September 9 - November, 10 2013. Added on June 25, 2013 by Matt Byers. The North of the 45th is an annual juried exhibition of artists living in the geographical area north of the 45th parallel in Michigan, Wisconsin and Minnesota. This line is known as the halfway point between the Equator and the North Pole, and crossing this line from the south is often associated with being “up north.” The exhibition showcases the breadth and depth of artists living in this upper Midwest region from both rural and urban areas. Each year a different juror is asked to select pieces for the exhibition from an open call for entries. This year’s juror selected 53 artists from a diverse field of 205 submissions. This year’s artists include: Janel Anderson, Ty Aymond, Richard Barlow, Lisa Bergh, Gregg Bruff, Catherine Brunet, Gloria DeFilipps Brush, Betsy Byers, Ginnie Cappaert, Edwin Carter, Todd Carter, Zach Collins and Ted Tollefson, Kathleen Conover, Joan G. Cox, Teresa Cox, Andrea Leila Denecke, Kelly Dorman, Preston Drum, Travis Erickson, Michael Friend, Lindsy Halleckson, Keith Holmes, Steven Hughes, Larsen Husby, K. Carlton Johnson, Emily Gray Koehler, Joyce Koskenmaki, Matthew Krousey, Pepe Kryzda and Maria Cristina Tavera in collaboration with ArtOrg, Christine Lenzen, Michael Letts, Mary Lingen, David Luke, Corbin Lutz, Shawn Malone, Adam McCauley, Andrew Nordin, Bernard Park, Lacey Prpić Hedtke, Paul Rose, Christy Schwartz, Michael R. Smith, Jr., Sean Smuda, Dave Tilton, Amy Toscani, Georgi Tsenov, Zerek Twede, Pamela Valfer, Paul Varga, Jeff Wetzig and Candace Zebell. This year’s exhibition is juried by Mason Riddle, a writer based in Saint Paul, Minnesota who has published widely on the visual arts, architecture and design. Recent publications include Artforum, Architectural Record, Ceramics: Art & Perception, Dwell, Metalsmith, Minneapolis Star Tribune, Rain Taxi, Sculpture Magazine, Surface Design and Walker Art Center Magazine. Her catalogue essay on new prints by Willie Cole was published in September 2012 by Highpoint Press, Minneapolis. Recent blogs for Metropolis Magazine feature a Q & A with Andrew Blauvelt, the architecture and design curator at the Walker, and a memorial tribute to the architect Lisl Close. Riddle recently organized an exhibition of photographs by Twin Cities artist Tucker Hollingsworth which explore the digital concept called "camera noise." Riddle is the former director of MN Percent for Art in Public Places program and interim director of The Goldstein Museum of Design. She has a M.A. in Art History and Museum Practice from the University of Minnesota, Minneapolis, and a B.A. in Art History and Studio Arts from Denison University, Granville, OH. Added on April 12, 2013 by Matt Byers. For the full text of the event, please click the link below. sts making their way to share their styles and methods of painting. These artists will be participating in the Art Lab activity in accordance with that day’s opening of the Walker Art Center’s newest exhibition, Painter Painter. This exhibition focuses on the development of abstract painting and the role of both the artist and the studio space. For the activity, visitors are invited to observe and talk to the artists as they work, then use that inspiration to create their very own painting. To get you pumped for painting, we asked each artist to share a brief bit about themselves, their work, and their space. Here are answers from the first three artists of the day: Betsy Byers, Kate Fartstad, and Eric Syvertson. Check out part II to hear from Tara Costello, Joonja Lee Mornes, and Jehra Patrick. Betsy Byers paints to discover and imagine relationships that embody our intimate experience with the environment in an abstract form. Her work often births from singular, elemental experiences of the body within space: feet touching water, the curve of the back nestle into rocks. In her paintings, Byers interweaves the psychological space and materiality of paint, as she searches for reciprocity between the self and the surrounding environment. 1. What’s your favorite part of your studio? My favorite part of being in the studio is the act of preparing my materials to work. It always surprises me to open my studio door and get a new perspective on a painting, even if it is has only been 10 hours since I last looked at it. I enjoy mixing paint, staring at my work and playing out new possibilities of compositions in my head before my brush even touches the surface of paper or canvas. 2. What non-traditional tools do you use to paint with? I use paint rollers, squeegees, rags, and spatulas in addition to a variety of brushes and palette knives. My favorite brush is a #4 flat. 3. When did you know you wanted to be an artist? I didnʼt paint with oil until I was 20 years old. When I was growing up I did a lot of observing, drawing and writing, but I never imagined that I would become an artist. I decided to major in art during college because art classes challenged me more than any other department. I chose to become an artist due to the questions that art raises. I am constantly engaged by my work in the studio and by my attempts to translate and develop a visual experience for others. Added on April 11, 2013 by Matt Byers. The Anita Sue Kolman Gallery in the Northrup King Building has been a celebrated gallery for two years, launching and recognizing some of the Twin Cities’ most unique visual artists, including Betsy Ruth Byers, Kelly Jean Ohl, Karl Unnasch, Patrick Kemal Pryor, Jodi Reeb-Myers, and Kate Casanova, who was featured on the cover of City Pages for the alt-weekly’s Artists of the Year issue. Now Kolman is joining forces with gallery artist and curator Patrick Kemal Pryor to reinvent the gallery as the Kolman & Pryor Gallery. “Juicy Steak Moustache II” opens the new Kolman & Pryor Gallery, on Saturday, March 16, and runs through Saturday, May 11. An opening night party on March 23, from 7 pm till 10 pm, will showcase the unique show and new partnership. Light hors d’oeuvres will be provided by Tryg’s Restaurant of Minneapolis. The show will feature engaging and interactive works by Kolman & Pryor Gallery artists Betsy Ruth Byers; Kate Casanova; Kelly Jean Ohl; Patrick Kemal Pryor, Jodi Reeb, and Karl Unnasch. Also featured will be works by painter, Emily Bennett Beck, who turns pop-culture iconography into often excruciating images; Kyle Fokken, who creates modern toy mash-ups using antique found objects; Danny Saathoff, who creates peculiar mechanical works and timepieces that beg users to slow down; and Dave Beck, whose 3D images are virtual sculptures of both the odd and mundane. Each of the pieces—from a flock of butterflies powered by a hand crank to a performance where participants are asked to draw on the gallery walls and kiss the artists—inspire people to think and interact in a unique way. Added on March 8, 2013 by Matt Byers. An exhibition featuring select Minneapolis College of Art and Design MFA students and their mentors. MINNEAPOLIS – Interaction: [in-ter-ak-shuhn], the new show opening at Burnet Gallery, explores the unique relationship between MCAD artist/mentors and their mentees. “The connection between the mentor and the student artist is a special partnership,” said Jennifer Phelps, Burnet Gallery art director. “We wanted to put the spotlight on this bond. Any submission from second year MCAD MFA students and their mentors was considered so long as each person was represented. The works could be similar or dissimilar, depending on applicants’ own practices, and the mentor and mentee could work together or separately on submitted pieces based on their practices, explained Phelps. The Minneapolis College of Art and Design (MCAD) Master of Fine Arts program is based on a mentor-style approach where students select a mentor from a list of MCAD Faculty and professional area artists, work one-on-one with their mentors discussing their goals as an artist, and develop strategies in studio art and liberal studies seminars to meet their best needs.